Imagine 150 teens sleuthing around the school solving puzzles, skipping lunch every day to gain advantages over other teams, students voluntarily solving extremely difficult puzzles. Each year we have tried to improve the hunt in substantial ways, including the appearance of “Stars” throughout the hunt that earned students extra points by rewarding teams that could find hidden elements of puzzle or solve daily bonus puzzles. We also made the prize money and trophies better this year. We had some bumps in the road, but overall, the 2017 hunt was a success. Months of work, and now our third puzzle hunt is in the books. For more details, including photos, videos, and the puzzles, visit the Pi Day Puzzle Hunt Website. 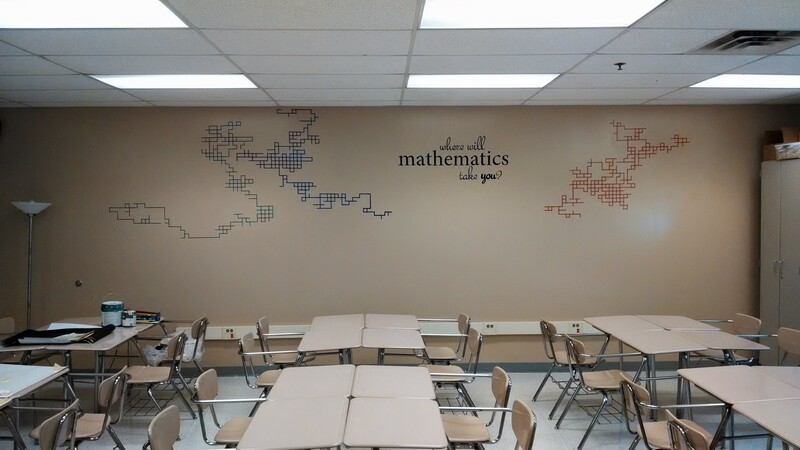 I’ve been meaning to give the back wall of my classroom a makeover for a while. This summer I finally found some time to tackle the big project. I took down all the decorations and posters. I fixed up the wall and painted it a nice tan color. Then, I let loose the randomness! I think the mural turned out pretty well! It was scary to be permanently marking my walls, not knowing where each path would take me, or how it would end up looking. At first I thought I would only do ONE random walk. However, the first random walk (in blue) went off the ceiling so I stopped. And then I decided to add two more random walks. In retrospect, it actually makes complete sense. I teach three different courses (Algebra 2, Precalculus, and Calculus) and I’ve always associated with each of theses courses a “class color”–green, blue, and red, respectively. I use the class color to label their bins, to write their objective and homework on the board, and many other things. The phrase “Where will mathematics take you?” was also a last-minute addition, if you can believe it. There just happened to be a big space between the blue and red random walks and it was begging for attention. What a good question for our students. The random walks provide an interesting analogy for the classroom. I’d like to say I’m always organized in my teaching. But some of the richest conversations come from a “random walk” into unexpected territory when interesting questions are raised. Can you figure out how many iterations occurred after looking at a “finished” random walk? Or perhaps a better question: What’s the probability that there were more than n iterations if we see m line segments in the random walk? After looking at a few random walks, can we detect any bias in a die? How many random walks would want to see in order to confidently claim that a die is biased in favor of “up” or “left”…etc? Some of the questions are easy, some are hard. If you love this stuff, you might be interested in taking a few courses in Stochastic Processes. Any other questions you can think of? 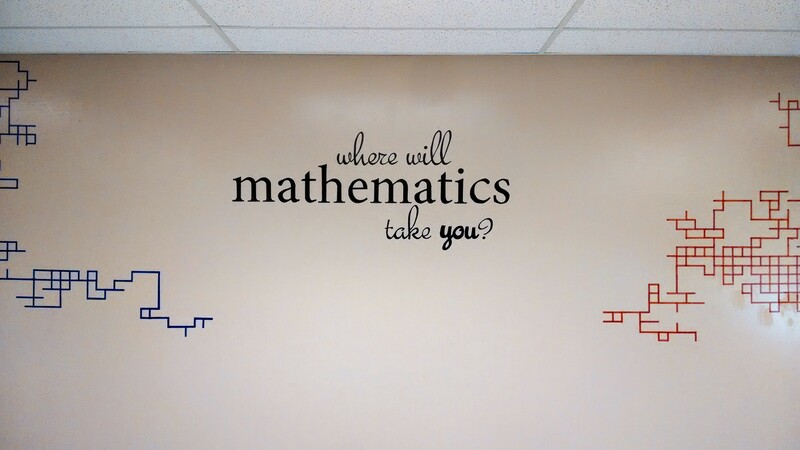 Where will math take you this coming academic year? Welcome back everyone! If you live in the DC area and you like math, you have no excuse! Come to the MAA Distinguished Lecture Series. These are one-hour talks, complete with refreshments, all for free due to the generous sponsorship of the NSA. The talks are at the Carriage House, at the MAA headquarters near Dupont Circle. Here are some of the great talks that are on the schedule in the next few months (I’m especially excited to hear Francis Su on May 14th). 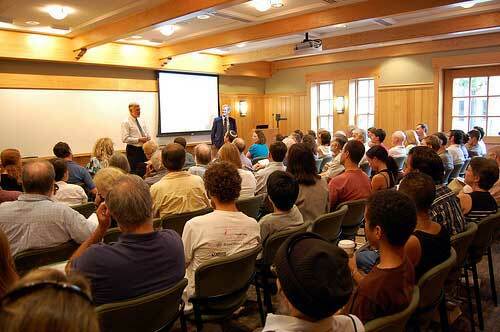 I’ve been to many of these lectures and always enjoyed them. Robert Ghrist‘s lecture was out of this world (here’s the recap, but no video, audio, or slides yet) and was so very accessible and entertaining, despite the abstract nature of his expertise–algebraic topology. And that’s the wonderful thing about all these talks: Even though these are very bright mathematicians, they go out of their way to give lectures that engage a broad audience. So, if you’re a DC mathophile, stop by sometime. I’ll see you there!